Say you're getting together with your friends. Cathy doesn't eat gluten. John doesn't do dairy. So you gotta find a place or some recipes for food that doesn't have dairy or gluten in it. You click on his icon and he's added to the list of people you're planning to eat with. Now you get a list of foods you can both eat -- you can sort them either by Recipe or by Nearby Locations, so whether you cook, or go out, you can find something. 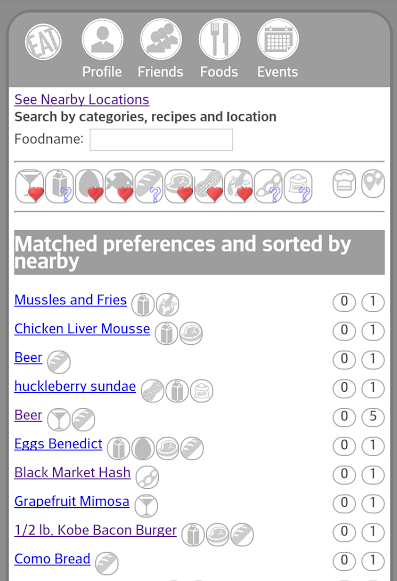 You can modify the search, and (comming soon) vote up or down food suggestions so they don't show up again, or, flag them if they're just dead wrong. Now, let's be honest -- I'm not an app developer. This is just an early start, and I appreciate feedback and any help anyone wants to offer. To that end, I have created an open API, which is documented in our Developers section. Sign up by entering your email on the developer's page and we'll get you added to the system (after a brief email chat). And, whether you can make a ton of money on your app or not, you will be awarded points in our "crowdsource equity pool." This is a really early-stage idea but as it's all about transparency and community, I want to toss it out there early. Check it out!